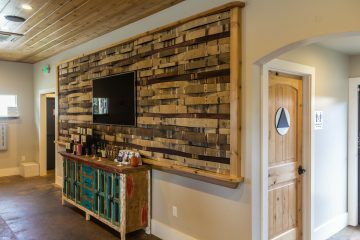 Modern technology has taken a lot of the challenge out of visiting new wineries. Punch in the address and let the gadget do the hard work. Except when it doesn’t! 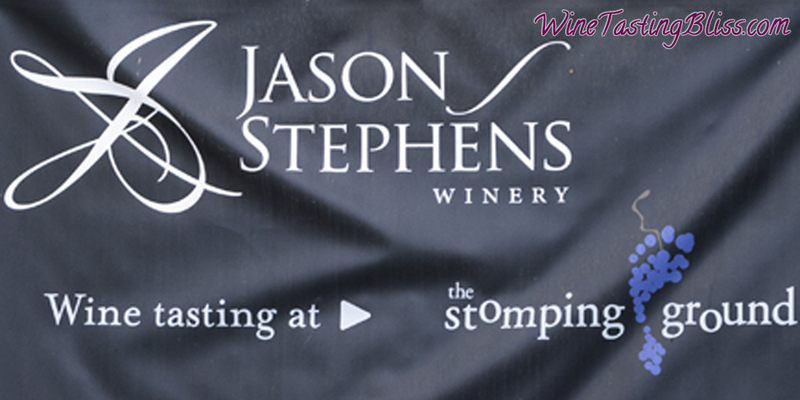 Visiting the Jason Stephens Winery was a bit more challenging than most, because the location is somewhat obscure, with very little help coming from our little GPS. 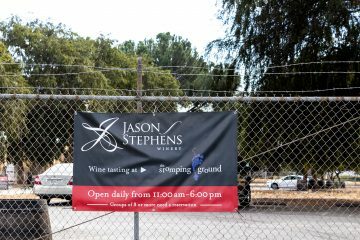 After driving around body shops and limousine services, our eyes finally fell on a fabric banner zip-tied to a cyclone fence announcing Jason Stephens and The Stomping Ground, a wine bar. We found it! We drove through the sliding gate to the parking area, selecting a nicely shaded spot. We could see the winery, as well as the walkway to the tasting bar. 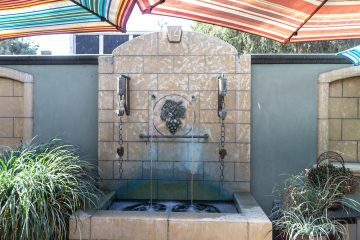 We could also see plenty of outdoor tables with shade umbrellas, surrounded by a tall stucco wall. 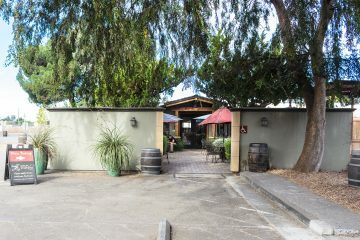 We walked through the courtyard, into an attractive tasting room. Since we were touring on a Friday, the tasting room was nearly empty, giving us our choice of spots along the beautiful under-lighted bar. 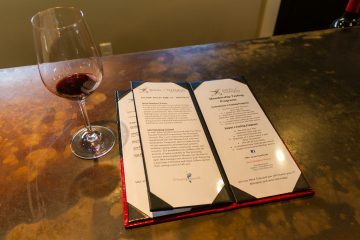 We met wine guide Melia, who welcomed us and got us set up for our tasting flight. 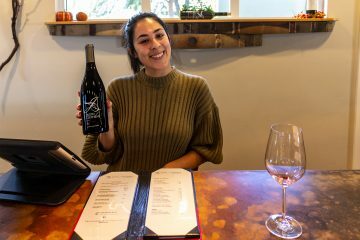 We learned that Jason and Janu Goelz were owners and winemakers, with Jason lending his name to these wine labels and his wine, Janu, producing wine under her own name, available at the neighboring wine bar. Melia started us with their 2014 Estate Reserve Chardonnay. The wine spent 9 months aging in oak barrels, lending a nice touch of tropical fruit and vanilla. We next tasted their 2014 Persing Vineyard Meritage. We enjoyed the clarity and balance of the fruit, with blueberries and grapefruit zest dancing across the tongue, leading to a crisp cherry and tobacco finish. Melia then poured their 2012 Estate Syrah. Jumping onto our Take Home list, we loved the dark plum and orange blossom notes, with smoke and pepper on the finish. Their 2014 Petite Sirah was next. Melia told us that this was their first Petite Sirah, bottled only two months ago. Bursting with cherry, thyme, and caramel notes, we enjoyed its youth and look forward to tasting this again after a few years on the wine rack. Their 2014 Malbec was up next, with gorgeous, deep ruby color in the glass. The balanced and layered fruit with deep black plum notes and a tobacco and green peppercorn finish made this wine ache to be paired with a steak and Bearnaise dinner. At that point, it was all over except for making the tough choices about our Take Home list. After some discussion and negotiation, we built our final shopping list. With thanks to Melia, we purchased our wine and set off for our next Santa Clara Valley winery. Things were going well, and the future was bright! Have you visited Jason Stephens? Click to give'em a tweet of support!